Diez, P.; Egozcue, J. J. A residual type a posteriori error estimator for finite elements is analyzed using a new technique. In this case, the error estimate is the result of two consecutive projections of the exact error on two finite-dimensional subspaces. The analysis introduced in this paper is based on a probabilistic approach, that is, the idea is to assess the average value of the effectivity index (the ratio estimated error over exact error) by assuming the randomness of the exact error. The average value characterizes the mean behavior of the estimator and it is found to be related with some geometric properties of the subspaces. These geometric properties are obtained from the standard matrices of the linear systems arising in the formulation of the finite element method. 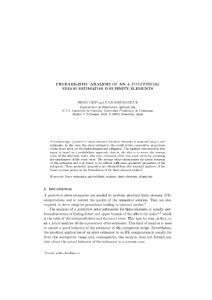 Díez, P.; Egozcue, J. J. Probabilistic analysis of an a posteriori error estimator for finite elements. "Mathematical models and methods in applied sciences", Agost 2001, vol. 11, núm. 5, Electronic version of an article published as [Mathematical models and methods in applied sciences , 11, 5, 2001, 841-854] [10.1142/S0218202501001136 ] © [copyright World Scientific Publishing Company] [http://journals.worldscientific.com.sg/m3as/], p. 841-854.